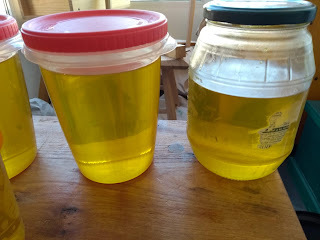 About two years ago I wrote on this blog about an experiment refining my own raw linseed oil. This post generated more feedback than any other I've done. It's weird that I haven't written about this stuff since. Today I bottled up what I made in my second batch that I started about a year ago. Take your pick: a Maß or a caña. I was able to get about two and a half liters of the finest BLO type finish I've ever used. I love this stuff because it doesn't smell like chemicals (but it does smell like the Mediterranean Sea), It covers wood nicely, and it dries quickly (and then is odorless). I think a better name for this stuff should be: Refined Linseed Oil. It's great that it can be done at home. This time I did things only a little differently. 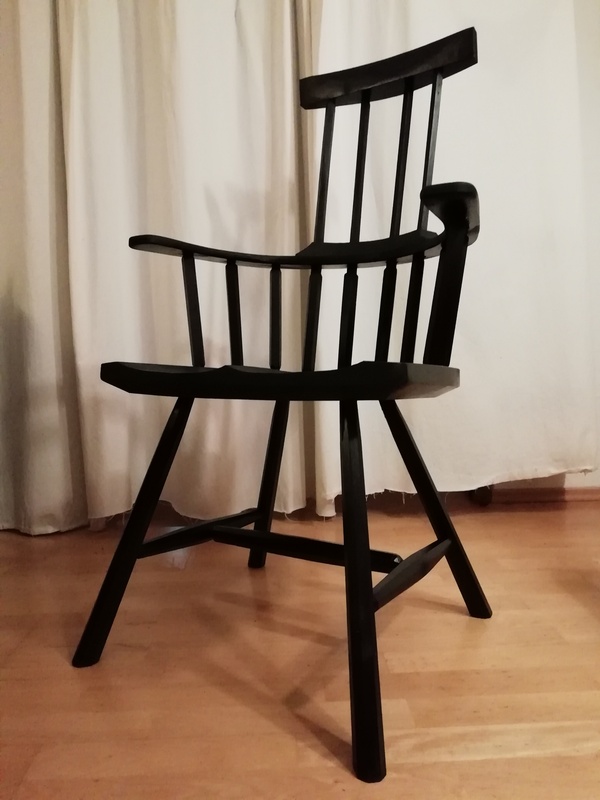 I started by buying a five liter jug of raw linseed oil (good stuff from a boutique shop). I couldn't find the lid to the big jar I used last time, so I went and bought three more. I bought plastic ones because they were cheaper. This was a mistake. It worked out alright, but I was continually worried that they would come apart while shaking, and there was indeed some leaking. Next time I'll make sure to use glass jars. Plastic jugs for refining the oil this time. Do yourself a favor and use glass jugs. 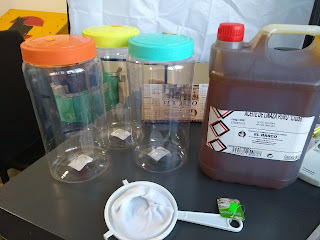 Just so you can see the difference, here is a picture of the stuff I made last time next to the jug of raw linseed oil. Last time I went to collect sea water and sand from the beach when it was a bit stormy. This time I got some water and sand that was much cleaner to start with. These materials are easier to clean before starting the refining process, and the final product smells only a little like the Med, as opposed to smelling like sludge water from the harbor. These raw materials were far superior to what I used last time. 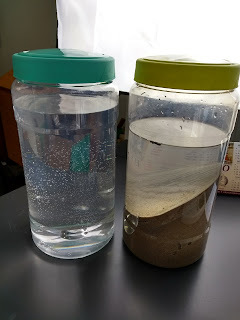 A bit of sand in the bottom of each jug, a liter of seawater and a liter of linseed oil in each jar. Shake like crazy and wait. 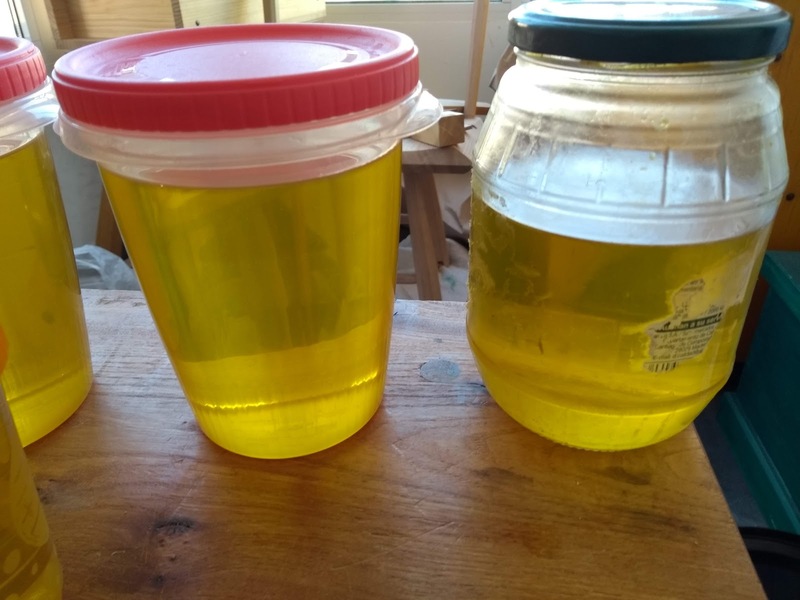 Plus, I still have about two liters of raw linseed oil to make some more. After a while you can see the oil floating to the top, above a layer of fat that we are refining out of the oil. The clear stuff is seawater and there is sand on the bottom. After an hour or two. 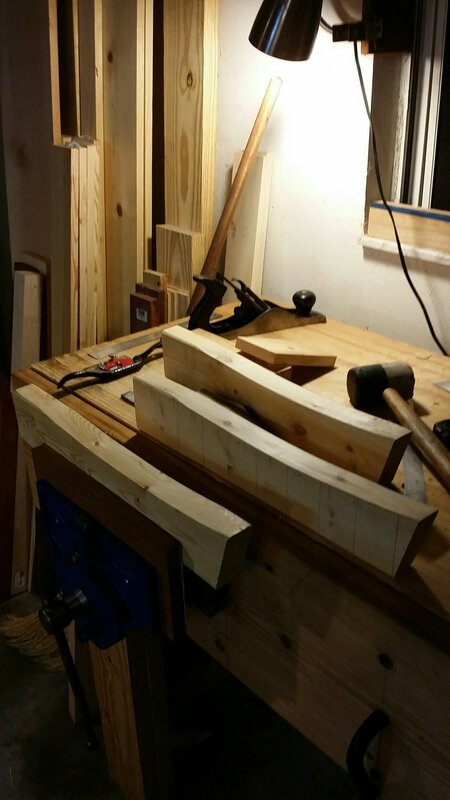 This time I left each iteration to rest a day or two. You can clearly see the layers in this photo. A day or two later. Here's an interesting photo: It shows how quickly things start to work. The one on the right I haven't shaken yet, the one on the left was shaken and rested about five minutes, and the one in the middle I have just finished shaking. I think this was after the first shaking, I racked off the oil on top and mixed it with plain seawater - no sand. After doing this for a few weeks (and couldn't be bothered doing it any more), I put the resulting oil in glass jars and put them in a sunny room where they wouldn't be bothered. They stayed here for about ten months. I left the lids off completely for a few weeks, then just rested them on top to help keep debris out. Let's wait for the sun to do it's part. The idea is sunlight does the last part of the process, which is to make the oil lighter in color. I think if all the fat is rendered out of the oil, the sun will eventually turn the oil colorless. The color I am at is just fine for woodworking, artists making oil paints might want it a bit clearer. 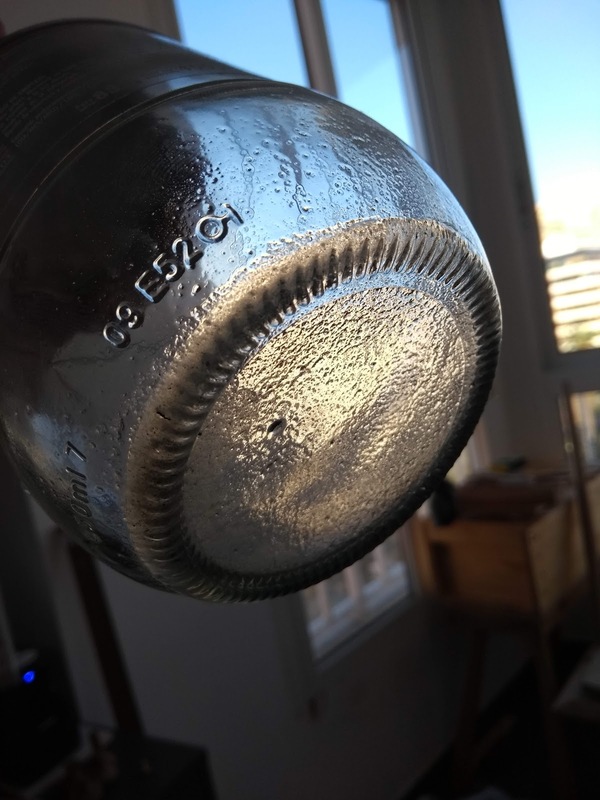 It could also be that the area I put the jars didn't get quite enough direct sunlight. The sun shines in that window only a few hours every morning. 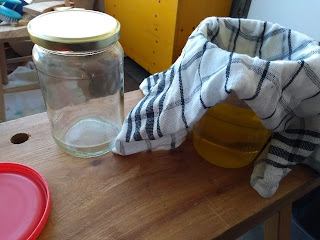 Once I collected the jars from their resting space, I filtered out any debris that was in the jars. I just ran the liquid through a clean shop towel, and in about ten minutes it was all done. Straining debris from the jars of oil. 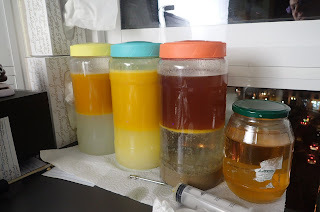 Much of the debris in the oil already collected on the bottom of the glass jars, and since I poured the oil out as gently as I could, it stayed there. It looks like Weinstein - the debris that is sometimes at the end of a bottle of wine.. 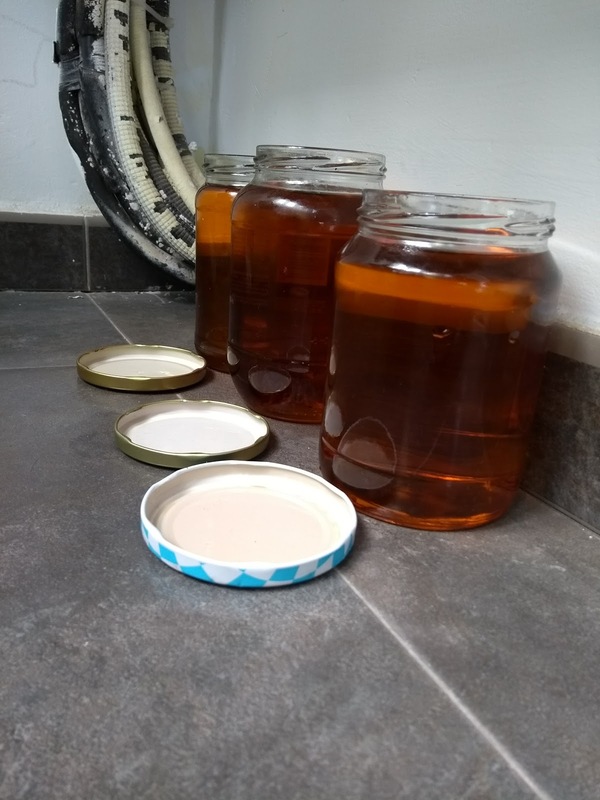 I decided to keep the oil in plastic jars that I bought especially for this purpose, because they do better on the bounce test with the tile floors in our apartment. I'll keep an eye on them and if the plastic starts to degrade I'll switch them over to metal or glass containers. It was an accident that they now look like the urinalysis cups that we used when I was in the Army. New batch on the left, old batch on the right. 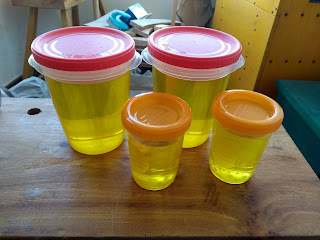 I have enough raw linseed oil left over for one more batch. I really like this stuff. It has no harmful chemical driers, and only smells like seawater for a day or two after it is applied to a wood project. So far, it works just like BLO, without the toxic smell. With the exception that I haven't come across the need to apply more than one coat. One might find it a bit thick, but you can mix it with turpentine to thin it out a bit, something I've done with BLO before on first coats. Usually, however, I just slather it on my project, wait a few minutes, then buff it out with a dry cloth. The first batch I have been using by itself, and I plan to experiment with this batch mixing it with some other things to try some other finish recipes that usually include BLO. I'll report how it works. I would certainly recommend this to anyone who wishes to try something a bit different. I think the resulting oil is of higher quality, and a lot safer and pleasant to use. The process is simple and easy, but it does take some time and patience. If you have no access to sea water, I'm pretty sure a heaping tablespoon or two of table salt in tapwater would work just fine. I've also been told an alternative to clean sand is kitty litter. Perhaps I'll try it this way someday when I get back to Munich. Check out my original post for more info on the process. Finally, some of the comments on the last post suggested a much simpler alternative to this process is just to buy plain old stand oil. I'm told it is a similar product. I promise I'll get some and do a comparison one of these days. 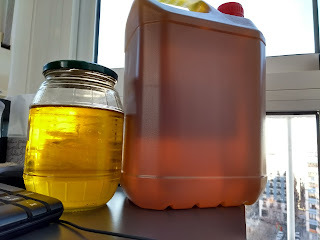 I've also been told that it is a bit different than regular stand oil, and is instead comparable to this oil (the German translates literally to "sun-thickened linseed oil), which is 234 Euros per liter at the time of this writing. For obvious reasons, I'll not be comparing my oil to this stuff. Give this a go if you'd like to try it. I'm sure you'll be happy with the results. If you do, please let me know your experiences with it. Thanks, Sylvain! Same to you and your family! That's a good idea. In English "raw linseed oil" is a finish, but the exact same thing used in the kitchen is "flaxseed oil." It should work just like this. You could also try skipping the water and sand part, and just put it in the sun and see what it does. Good info, the oil is no problem nor is the sand but when in heck do I find seawater in the Arizona desert :-). Haha! My local supermarket actually sells bottled seawater for 3.99/liter or something. Weird since we live about a three-wood from the harbor. I'd just put a couple tablespoons of table salt in some tap water if you want to go through with it. It sounds like a much better finish recipe that the on I tried from horse manure and urine. But not nearly as entertaining to read about! I love this stuff, Brian. You're getting to be a regular Steven Shepherd. I wouldn't go that far. But thanks for the kind words, Matt! I have to wonder, though whether storing the oil in glass vessels will sun bleach as well as plastic. Glass is pretty effective at blocking UVB, the more energetic light, and some glass, especially the green tinted kind, will also block the more energetic part of the UVA spectrum, as will crystal glass on account of its lead content. I’m going to have to try this. My chemical sensitivities are acute after years in the trades. Hey Larry, Thanks for the comment. I haven't had problems with the oil lightening to the color shown in the pictures using glass jars. But, it could be that you are right. My oil is now in plastic bottles, but I'm worried the lids aren't quite what they need to be, so I'll move them into something else soon. I'll keep my eyes out for some appropriate plastic containers. Good luck trying this out, I'd love to know what you think once you're done. Hello ikus007, thanks for the comment! Sadly, I am not much of a chemist, so I'm not sure why. I have followed the instructions (with only small tweaks) provided elswhere. The original post (link is in the body of this post) has a video that inspired me to try this, and it also has links to some other people's work who understand this much more than I. That being said, I have no idea why to put it in the sun. Perhaps it works fine after rendering, but my understanding is the quality goes up with less color in the oil. Taking this process to it's ultimate conclusion would yield an oil which is colorless, which I can see would be extremely valuable to artist painters, but a bit of color in it for woodworking shouldn't hurt anything. 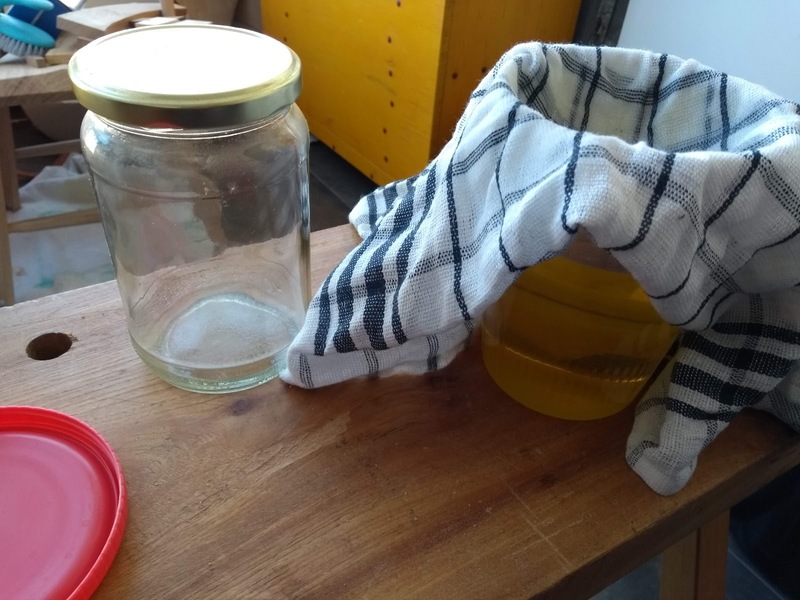 The most important thing in this process is to remove the fat from the raw linseed oil, as that is what prevents the oil from drying quickly. Extremely interesting , the fat situation. So that would have been the old way of favorising polymerization by diminishing the qt of fat elements... Favors the oxydation maybe. Very interesting about the fat. Maybe it slows down the polymerization or the oxidation. Thank you very much ! I am wandering if boiling the raw linseed could allow for a faster polymerization. Many bowl and spoon carvers use a low temp oven ( bulb light box) to provide heat and accelerate polymerization. Could be. Boiling linseed oil sounds a bit dangerous, though. I know the old painters loved this stuff for a base for their okl paints because the color would stay the same for generations without darkening. 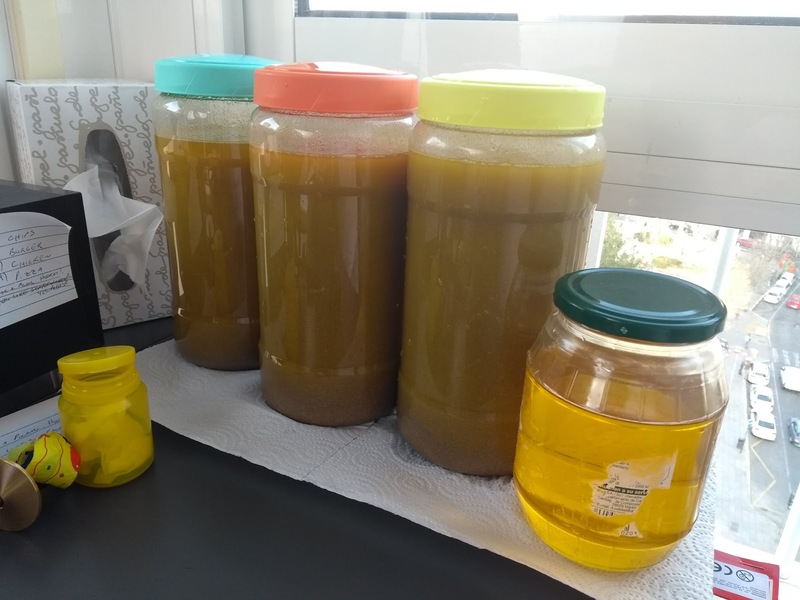 Great to see your experiments being so successful, I might have to try this as I still have about 3,5 litres of raw linseed oil at home. Sea water would be hard to come by but I know DM sells a salt bath from the dead sea that might work. The only thing I worry about is the lack of sun here in Germany! Hey Rudy! Thanks for the comment. Try kitty litter. I'd love to hear if that works as well as I think it should. You're welcome. Your questions have inspired me to do some side by side tests. Look gor that post in the coming weeks. What does the salt do in the process? How does the final product harden, is it hard enough and is the surface shiny or matte? Hey Ty! It's good to hear from you. I have no idea what the salt does. I suspect it AIDS in washing the fat from the oil somehow. I chose seawater because of it's availability. The original recipe I saw used table salt and marble dust. The final product works pretty much just like BLO that you get off the shelf. But, I'll do a comparison soon to see. Would love to learn more if you do a test on hardness and hardening time. There should be a post about this in a couple days. Not too overly scientific, I'm afraid. So far, the results are a bit surprising.